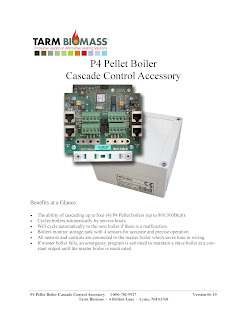 With the cascade control, up to four P4 pellet boilers can be cascaded together. This gives you the ability to handle heating loads of up to 800,000Btuh. This is great for larger buildings and offers the flexibility of having redundant boiler systems and having multiple boilers to satisfy a larger load instead of one larger boiler to handle both the high and low demands of the heating season. Cycles boilers automatically by service hours. Will cycle automatically to the next boiler if there is a malfunction. Boilers monitor storage tank with 4 sensors for accurate and precise operation. All sensors and controls are connected to the master boiler which saves time in wiring. If master boiler fails, an emergency program is activated to maintain a slave boiler at a constant output until the master boiler is reactivated.